Going on a picnic? Why not make some cheese pimiento triangles? This appetizer is delicious, nutritious, and oh-so-easy to make. Put the grated cheddar cheese and pimiento in a bowl. Add enough mayonnaise to cover the cheddar cheese and pimiento. 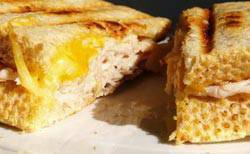 Spread the cheese mixture on a slice of bread and top with another piece, making a sandwich. Cut the sandwich on the diagonal making two triangle pieces.